They say "A happy family is but an earlier heaven". Come have a look around and immerse yourself in our brand of heaven! Join Pamela & Matthew and their three kids Isaac, Asher & Shawna in their adventures duly logged in The Tan Family Chronicles! Studio pix batch 4! Just three pictures this time round. It was really fun taking pix that day. We only wished that Shawna was awake when we took pictures. But with kids that young, it's hard to coordinate. But think the pictures still came out pretty well. So it's a good thing that Shawn & Helena (Mr & Mrs Photographer) have converted one of the rooms in their home into a home studio! We can't wait to try it out! Especially now that the twins are older and are able to keep awake for a longer period of time. Look at these two pix ;p I thought hubbs looked quite funny hahaha reminds me of the times when we did Playback Theatre. Think the next time round when we take pix at the home studio, I'm gonna suggest we take more candid shots like that. Experiment a little, huh. I'm so fat I need to exercise!!! urrghhhh!!!! Just on Sunday, hubbs took a pic of me and Isaac. I looked at the pic and said:"Gosh! I look so fat here!" And hubbs said:"Right. Yes. That's what it is." BASKET. sighz. I need to exercise!!! This blog was started, originally, to share with our friends and relatives, in Singapore and abroad, our pictures and stories of Isaac our first child, growing up. Since then, we have had another two babies: Asher & Shawna, our fraternal boy-girl twins :) Yes we are very blessed indeed! We're pleased that our family has grown, and we would like to share our wonderful journey with you. We hope to be an inspiration to all such that they will want to start a family asap - for "A happy family is but an earlier heaven!" - this is where heaven is a place on earth! Studio Pix on 10th April 2010! Asher & Shawna, my happy babies! 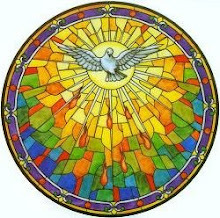 May the Holy Spirit be on us all! Mr Samat, the man with thousands of daughters! Of course the kids fight! A Dollop Of Me - Woman. Wife. Mother. 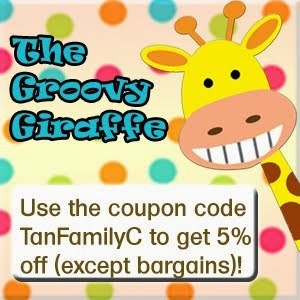 Use "TanFamilyC" coupon to get 5% off your purchase! Make the groovy prices even groovier!!! Blog Train Blog - free kits! Copyright (c) by the author. All rights reserved. No part of this blog may be reproduced, stored in a retrieval system, or transmitted, in any form or by any means, eletronic, mechanical, photocopying, recording, or otherwise, without prior written permission of the author. 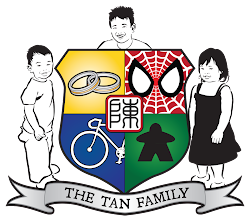 This blog is a personal blog written and edited by Pamela Tan, and only very occasionally by her hubby Matthew Tan. For questions about this blog, please contact Pamela Tan (emailpamela(a)yahoo.com). We write for our own purposes. Please note that we will very likely be influenced by our background, occupation, religion, political affiliation or experience. This blog abides by word of mouth marketing standards. We believe in honesty of relationship, opinion and identity. If any form of cash advertising, sponsorship, paid insertions or other forms of compensation have been received, that content, advertising space or post will be clearly identified as paid or sponsored content. We are open to, and may accept and keep free products, services, travel, event tickets, and other forms of compensation from companies and organizations. While we are not compensated to provide opinion on products, services, websites and various other topics; the views and opinions expressed on this blog are purely the blog owners. If we claim or appear to be experts on a certain topic or product or service area, we will only endorse products or services that we believe, based on our expertise, are worthy of such endorsement. Any product claim, statistic, quote or other representation about a product or service should be verified with the manufacturer or provider. All views expressed in this site belongs to me and is mine alone. They do not necessarily represent the views of any individuals in my immediate and extended family, friends, acquaintances, colleagues, neighbours or strangers who claim to know me. I do not have any intention to malign any religion, ethnic group, club, organisation, company, individual, anyone or anything. Most of the photos in this blog also belongs to me. Where the photos belong to others, I have always tried to have them credited as such. If you see any of your pictures on my blog that is not appropriately credited, please do not hesitate to inform me. Similarly, if I had inadvertently offended you in any way, whether it is due to the views or pictures I have posted, please trust in that I did not intentionally do so. Do email me at "emailpamela(a)yahoo.com" to inform me about it, and we can do something about it. As you should be aware, a blog is always in transition. Any information that is published in my blog may not be accurate in years, months, days, or even minutes from the date and time of post. No content should be reproduced without my explicit permission, and this includes my writing, opinions, photos, views or comments. You are however welcomed to link to blog posts on this website. Commercial use of any information/post in this blog may be negotiated. Please contact me in advance before any such use is effected. I reserve the right to reject any request to authorise usage of my blog content, without the need to provide reasons, whatsoever. All content provided on this blog is for information and entertainment purposes only. 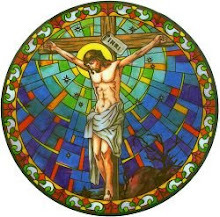 I do not make any representations as to the accuracy or completeness of any information on this site, or that which is found by following any links indicated on this site. I will not be liable for any errors or omissions, for the availability of any information as stated, or for any losses, injuries, or damages sustained from the use of these information. This policy is subject to change at any time without prior notice and without any assignment of reasons. 1. Comments deemed as spam or questionable spam. 2. Comments which contain profanities. 3. Comments containing language or content that could be deemed offensive in any form. 4. Comments attacking an individual person.